Haldor Topsoe, a world leader in catalysis, specialises in the production of heterogeneous catalysts and the design of process plants based on catalytic processes. As one of the world’s leading catalysis companies with a long history of involvement in the Middle East, Haldor Topsoe process technologies focus on the chemical and petrochemicals sectors, refineries and power plants, and the fertiliser industry. Earlier this year, Haldor Topsoe opened offices in Al Khobar, Saudi Arabia to complement its global offices in Bahrain, Canada, China, India, Malaysia, Russia, Argentina, and the US. The company headquarters and main research laboratories are in Lyngby, near Copenhagen, Denmark with catalyst manufacturing in Denmark and Texas, US. 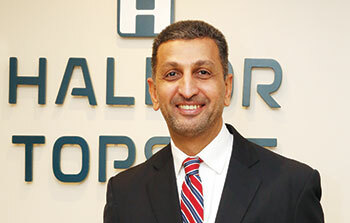 Mahmoud Ghanem, Country Manager of Haldor Topsoe, Saudi Arabia is in a confident mood as he discusses the establishment of a Saudi Arabian operation to serve the kingdom to meet anticipated demand and be closer to its customer base. "We are a world leader in catalysis and also a technology company which provides licensing and process plants in the chemical and petrochemical sectors. For example, we provide hydro-processing, hydrotreating, hydrocracking and petrochemical plants (ammonia, methanol and hydrogen). In addition, we have very experienced technical service teams for our customers in the region," says Ghanem. As Ghanem explains, Haldor Topsoe has developed its global leadership on delivering catalysts, specialist technologies and related services to the chemical and refining industries since its establishment in Denmark in 1940 by Dr Haldor Topsoe. In-house Research and Development and close cooperation with external research organisations and academia have led to the development of leading specialist technologies for global customers. The company’s catalyst products and technologies are used to clean oil and ensure more environment-friendly fuels, and for converting hydrocarbon feedstocks such as natural gas and LPG into ammonia, hydrogen and methanol and for reducing emissions. In chemical plants, catalysts and processes optimise resources ensuring more efficient energy processes. "Haldor Topsoe invests heavily in R&D in both technologies and catalysts. We are also busy in many hydro-processing and hydrogen start-up plants in Kuwait as well as co-development projects with leading Saudi companies," adds Ghanem. Ghanem, a US chemical engineer has a strong career track record in Saudi Arabia including five years with Sabic as global business manager in polymers and more recently with Sadara. Ghanem fully understands the potential for business development in Saudi Arabia and being close to his customers. In terms of new technologies, Haldor Topsoe has implemented various new technologies into the region. "We have ATR technology called SynCOR which was implemented in the GCC and around the globe," he says. Outlining the Saudi Arabia strategy for Haldor Topsoe, Ghanem emphasises that as well as opening local offices in the Eastern Province to serve the kingdom and be close to customers, the company is also focusing on consolidating the company’s products and services portfolio. This involves intensifying efforts in developing innovative products backed by significant research and development. These innovative products include the sulphuric acid catalysts and the SynCOR ammonia technologies. According to Ghanem, Haldor Topsoe will similarly expand its in-kingdom research and development presence in Saudi Arabia by entering into new partnerships with local companies and research institutions aligned with Saudi Vision 2030. Currently, four Saudi students are being trained at the King Fahad University of Petroleum and Minerals (KFUPM) as part of a Haldor Topsoe internship programme. The new offices will also be part of Saudi Aramco’s In-Kingdom Total Value Add (IKTVA) plan. The company’s relations with Saudi Arabia and Saudi Aramco are historic and have evolved over many years with Dr Haldor Topsoe, the company founder (who died in 2013), a regular visitor to Saudi Arabia. "Dr Topsoe visited a number of leading companies in Saudi Arabia in the past and our relationship goes back to many years. Currently, we are involved in the clarification phase in the Oil to Chemical (OTC) project. Crude oil-to-chemicals technologies are set to have a significant impact on the chemical industry with catalysts conversion and new technologies helping create value. According to Ghanem, Haldor Topsoe’s business growth is healthy and has seen steady growth over a number of years. "We are seeing big potential and that is why we are opening our new offices in the kingdom. We are taking part in the Saudi Aramco journey as its going downstream where we believe Haldor Topsoe can add a lot of value," he says. The new Saudi office, which opened recently, is located in the heart of Al Khobar close to Dhahran and Jubail in the eastern part of Saudi Arabia and is headed by Ghanem. "The rest of the top management and I have great expectations for this office and the sustainable business it will bring about," said EVP Morten Schaldemose at the inauguration. "I see a strong match between us and the Saudi industry." Several key customers in the kingdom including Sabic, Saudi Aramco, Air Liquide, Educational institutes (KFUPM) and representatives from Danish Embassy in Saudi Arabia attended the inauguration. The Saudi office is a step forward to help the company’s Saudi customers, as it has a presence in the kingdom now. "This office will help, support, and make us more involved and engaged with key customers," says Ghanem. Haldor Topsoe is currently engaged in co-development with key Saudi chemical and petrochemical companies. Importantly, Haldor Topsoe can supply technology for ammonia, methanol and hydrogen that are proven technologies. 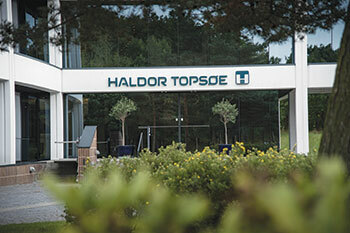 Haldor Topsoe has 2,400 employees, with around 12 global offices and several production facilities around the world including Texas, US and Denmark. Bahrain will serve the Kuwait and GCC markets including Pakistan with the Saudi Arabian offices of Haldor Topsoe serving the kingdom.